First of all, I’ll admit, I’m a pizza snob. There are only a handful of pizza places in existence that I consider great (and most of these are in or around New Haven, CT), a few more that I consider good (American Flatbread, for one example in these parts), and the other 99.9% are just plain mediocre. Northern New England, in particular, is mostly filled with mediocre “Village Pizzas” and “Houses of Pizza” serving bland pizza with questionable cheese on soggy crusts, or places with elaborate brick ovens that, despite having good equipment, manage to turn perfectly good raw ingredients into leathery pucks. Pie-casso in Stowe, VT, however, is one of the notable exceptions to this rule. 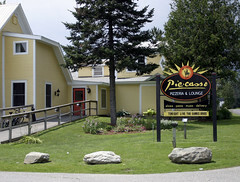 I’ve been eating at Pie-casso since they opened (disclaimer, I’m related to one of the pizza chefs there, which is what drove me to visit the first time, although in my dozen visits to the place he’s never actually there), originally in a much smaller location across the street. The pizza chefs at Pie-casso do indeed manage to produce a thorougly good pizza, with a firm and chewy crust, a tangy sauce, decent cheese, and good combinations of toppings (I seem to always get the vegetarian Tree Hugger), all very nicely toasted to a crisp in the oven. The pizza has never disappointed me (and those that have eaten pizza with me at most places know that this is strong praise). And I’m happy to see that they’ve moved into larger digs (the original spot was rather cramped, especially on rainy days), having replaced Cafe 108. That said, there seem to be some growing pains, despite being not terribly busy (although the bar section had a healthy crowd watching World Cup), the service was very slow, and the kitchen seemed unable to keep up with order. That, and the larger space is also reflected in the larger price. Oh well, the pizza was still definitely worth it, and if you want a seriously good pizza, it’s one of the best places in Vermont to get it. Well, it might be a biased review… I think our cousin runs the joint…. ince I’ve basically exhausted the list of Diners in the Upper Valley, I figured I should review some of the other breakfast joints. I’ll start with one of my favorites: Dana’s by the Gorge in Quechee, VT (umm, by the gorge…). Anyone who regularly dines with me knows that my favorite breakfast items are, roughly in order, biscuits and gravy, pancakes, and waffles. So usually when I’m visiting a place for the first time I’ll have one of these three items. However, Dana’s was different, since one menu item jumped out at me: the Vermont Rarebit (pictured at right). It’s basically an eggs Benedict dish, with the hollandaise sauce replaced with a Welsh-rarebit style cheddar sauce. Very delicious, and I seem to order this 90% of the time I’m there. And, in season, I visit there often enough that they are starting to recognize me.